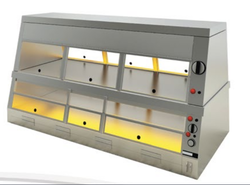 Providing you the best range of ss boiling pan, commercial roboqbo universal processing machines, commercial universal cutter and display warmer with effective & timely delivery. Ever since our inception, we have been fruitfully engaged in manufacturing and supplying a large stock of SS Boiling Pan. These pans are indirect water heating equipment that is integrated with double water jacketed frames. Our pans are extensively used in many commercial kitchens for the bulk boiling of milk, rice pulses, pulses, and vegetables. Before foal dispatch, we duly inspect the line of Boiling Pan on the basis of durability and functionality. 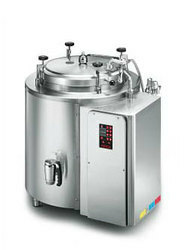 Boiling pan is double water jacketed indirect heating equipment for bulk boiling. Applications vary from milk boiling, steaming vegetables, rice and pulses to milk production. pastries, chocolate, ice cream, gastronomy, restaurants, food processing, ready meals, dairy products, farms and country houses. based on the models price will be vary. perfect, even, extremely rapid cooking that is delicate at the same time, capable of preserving the nutritional properties in foods thanks to the aps heating system (advanced power steam). ultra rapid product concentration processes, carried out in just a few minutes, saving literally hours of time when compared to traditional systems. results of extraordinary quality with strongly enhanced aromas and unaltered natural colours. 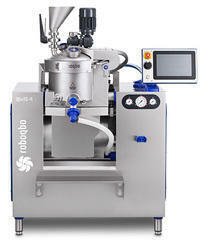 automatic wash programme and steam nozzle for external cleaning. spreads, anhydrous cream, pastes with hazelnuts / almonds / walnuts / peanuts / pistachios / pine nuts / sesame and coffee pastes. toppings, fruit juices, candied fruit and mixtures. tomato puree, concentrates, pesto, ready-made sauces, bolognese sauce, bechamel, vegetable creams, soups, pates, smoothies, mayonnaise, risotto, homogenised products for baby food and special diets, mixtures. melted cheese from fusion of soft cheeses and/or hard cheeses, analogue cheese, mozzarella paste, yoghurt, tofu. With the help of our efficient workforce and technology friendly approaches, we are certain to offer an innovative range of Commercial Universal Cutter. These universal cutters are largely used for milling and grinding different metal parts in automotive, electrical and plastic industries. We use best grade metals and modern technology to manufacture universal cutters at our state of the art machining facility under the observation of expert engineers. Moreover, our esteemed clients can avail these universal cutters from us at an affordable price. 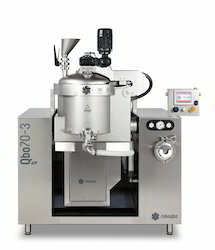 Capacities available from 8 to 550 litres per batch. We are offering Display Warmer to our clients.